I love the name of this beer, Dragon’s Milk! It is brewed by New Holland Brewery out of Holland Michigan. Having had several New Holland beers in the past, I was looking forward to trying another one of their beers and my first from their High Gravity series. There are 8 beers in the High Gravity Series all with an ABV of at least 7% and most over 10%. A high Gravity beer initially has a lot of sugar in the pre fermented beer which results in a large difference in density compared to water and generally results in a higher alcohol content, which in beer geek speak is the beers’ gravity. Your beer lesson of the day, now onto the beer! Expect a complex ale with a soft, rich caramel-malt character intermingled with deep vanilla tones; all dancing in an oak bath. Unmistakably distinctive example of New Holland’s Art in Fermented Form. Well, it looks like a stout or porter, a very dark beer with ruby highlights. Think amber head, that stucks around for a long time, resulting in some serious lacing. The foam from the lacing was almost pasted the side of my glass. Ahhh, this smells good! Strong aroma of Oak, Vanilla, Coconut, and also some chocolate under it all. Really an amazing complex aroma coming from this beer. Saaaa-mooooth! For a 9%abv beer this is amazingly smooth and lush. This was like chocolate milk spiked with bourbon. Strong oak and vanilla flavors add to the intensity of the chocolate and bourbon. the coconut didn’t really come through in the flavor, I’m not sure why, but I was relieved about that. This is a delicious complex beer. Loved this beer. I thought it was well crafted, well balanced with out being namby-pamby about the bourbon or the oak, but still keeping them in check. I highly recommend going out and trying this beer. I agree. I thought this beer was fantastic. I haven’t found anything else from the series. Fantastic looking bottle, too. @nate – I’m glad I bought two bottles!!! I’m going to ask my distributor about that, where are the others. I think New Holland is fairly new to Jersey. Kevin M. if your reading this, have you guys seen any other Garvity Series in your store? I have not seen any others yet, Peter. I have The Poet and Mad Hatter in stock now, and we recently ran out of Ichabod, the pumpkin beer. 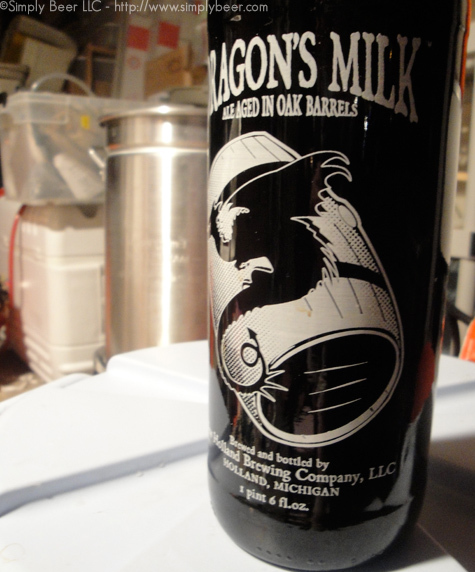 I still have a bit of Dragon’s Milk left… that stuff is delicious. Looks like I’ll have to pick up some Mad hatter! Aw crap!! I was looking at this last night and didn’t pick it up!! Maybe Kevin M will save one for my next trip over to the Liquor Outlet…? ok maybe i’m just crazy then, but this beer was awful, way too many flavors going on, coffee? chocolate? wine? pick one maybe, i mean if you were going for most flavors to stick in a beer and then make the after taste like grain alcohol you win first place. I love good beers, this is someone who just kept dumping in too much of a good thing and went over board. sometimes guys, less is more, and in this case couldn’t be more true. Thanks for Your comment John. I agree there is a lot going on in this beer and it isn’t going to appeal to everyone, but it did to me. Then again, if we all liked the same thing it would be fun. agreed,, variety is the spice of life. I’m wondering, as i only had one of these beers, if my palette had been botched for this because i had two extremely hoppy beers prior to trying this and that perhaps I need to sit and have one fresh. Previous story Brewed with real Oysters?